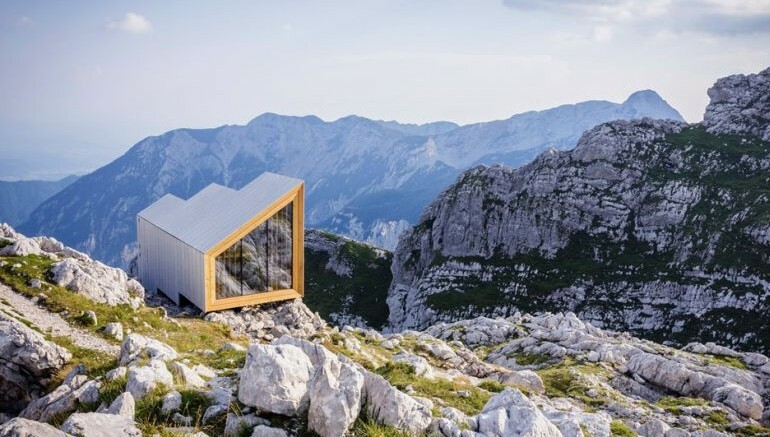 As part of a unique initiative, designers from Harvard University Graduate School of Design, Slovenia-based OFIS Architects and AKT II have come together to construct a stunning, yet robust, cabin that can withstand the harsh alpine climate of Central Europe. Located on top of Mountain Skuta in Slovenia, this prefabricated Alpine Shelter boasts a modular layout, with simple, minimalist interiors. 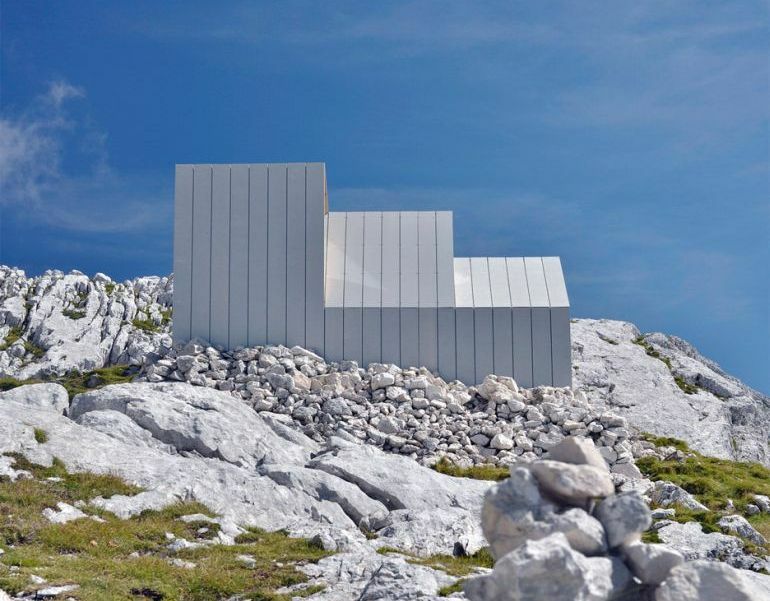 Airlifted onto the peak by the Slovenian Army, the mountain-inspired structure was recently featured in a film by the studio Carniolus. 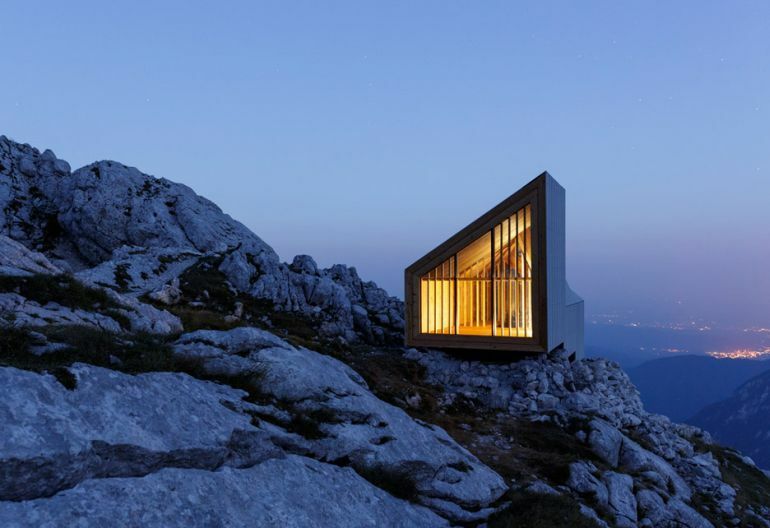 Designed as a shelter for mountaineers attempting to climb the Skuta Mountain, the third highest peak in the Kamnik Apls, the cabin was built last year as the replacement of a former 50-year-old storm shelter. 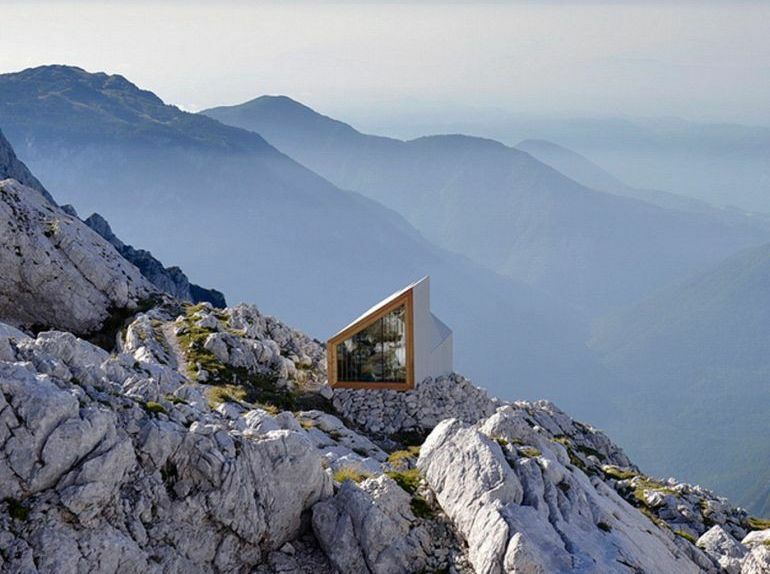 Developed by Frederick Kim, Katie MacDonald and Erin Pellegrino as part of OFIS-organized Habitation in Extreme Environments workshop, the design mimics the surrounding landscape, while also providing breathtaking views of the Slovenian mountain range. The cabin’s angled roofline, for instance, is reminiscent of the snow-covered peaks lining it on all sides. The bivouac [shelter] is an object that represents a basic human necessity. It is a symbol of refuge. The outer form and choice of materials were chosen to respond to the extreme mountain conditions, and also provide views to the greater landscape… The extreme climatic conditions in the mountains introduce a design challenge for architects, engineers and designers. Within a context of extreme risk to environmental forces, it is important to design buildings that can withstand extreme weather, radical temperature shifts, and rugged terrain. Although the scale of the bivouac is small, the project required a lot of effort and planning from over sixty participants who were mostly volunteers and sponsors. All would agree that, despite the small size, it was no less demanding than any large building project. However, all of the effort and planning for this small-scale project is meant to keep the memory, spirit and culture of the mountains as a special place for Slovenians. The hope is that the bivouac will serve as a shelter for all of the climbers who need it, and that through their care and attention the bivouac will continue to do so for many years. To know more about OFIS Architects and its various project, head over to the firm’s official website.